There is no lack of research linking obesity and calories. The excessive intake of sodas loaded with refined sugars, especially high fructose corn syrup, is known to be a top contributor to weight gain. Well, you will be surprised how these truths about sugary drinks can be so audaciously twisted. Heard about The Global Energy Balance Network, which claimed to be a not-for-profit organization dedicated to the "science of energy balance" to end obesity? Since August 2015, this group has been rolling out a campaign to propagate the message that fast food and sugary drinks have been unfairly blamed for obesity and related health issues such as heart diseases and diabetes. The "scientists" (they may be real, but I am not sure) from the organisation are maintaining that the key to weight loss is not about eating fewer calories but leading an active lifestyle. Watch this astroturfing video. I bet you will be disgusted by what this "health organization" is educating the public. The group's vice president, Dr Steven Blair, an exercise scientist says this in the video, "Most of the focus in the popular media and in the scientific press is, 'Oh they're eating too much, eating too much, eating too much' - blaming fast food, blaming sugary drinks and so on… there's really virtually no compelling evidence that that, in fact, is the cause." Apparently, in this video, the role of diet is being played down and inadequate exercise is portrayed as the real culprit of obesity. Naturally, you will also be wondering why these guys are posing as health experts and making up these lies about diets. Well, the truth is, the Global Energy Balance Network, the producer of the above video, is funded by the world's largest producer of sugary beverages, Coca-Cola. Shockingly, the sponsorship was not even disclosed from the start. The website and social media pages of The Global Energy Balance Network had remained silent about Coca-Cola's sponsorship until an obesity expert at the University of Ottawa, Yoni Freedhoff, criticized the organisation's transparency about research funding. With mounting scientific evidence that highly refined sugars can pose many health issues such as obesity, heart problems and even cancer, people have become more informed and educated about eating habits and more cautious about consuming sugary foods. As a result, the bottom line of soda companies is affected. It is said that in the last 20 years, the consumption of full-calorie sodas by the average American has dropped by 25 percent. To prevent their sales from further slipping, Coca Cola in this case is seen to have resorted to promoting the reasoning that there has been too much focus on what and how much people eat and people are neglecting the importance of exercise. In this age where soda companies are having a major clash over the science of obesity and experiencing intensifying pressures to limit soda sales in schools and ban soda advertisements targeted at children, we just need to get our antennas up when evaluating contrary health messages about sugary beverages. You think about it, while exercise does great things to our body and immune system, when it comes to weight loss, indisputably, it is a lot easier and faster to drink a can of soda than exercise that can of soda off, isn't it! 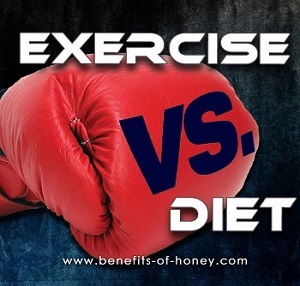 You can't out exercise what you eat! 1. Start on a weight loss diet to rid of obesity which can lead to potentially lethal health problems: Start Your Weight Loss Diet Today! 2. The more low-fat, fat free, low sugar products there are, the less control we seem to have over our appetite and our waistlines: The Obesity Paradox of Today. End of "Coke's Opinion About Obesity and Calories". Back to Honey and Weight Loss: How are the Two Connected?